Champagne Thursdays: Glue sticks, Pencils, Construction Paper..Oh My! Glue sticks, Pencils, Construction Paper..Oh My! It's starting to feel like Fall around here, so you know what that means...back to school. I even had my seat warmers on in my car this morning. Parker started school last Wednesday and Ryder started today. I'm not going to lie, waking up to an alarm clock isn't my favorite thing. I am happy to be getting back into a routine, though. Parker started First grade and is loving it so far! He has a few good friends in his class and their moms just happen to be my friends, so it's fun for me too. I appreciate the fact that he will still wear cute outfits that I pick out for him on the first day. 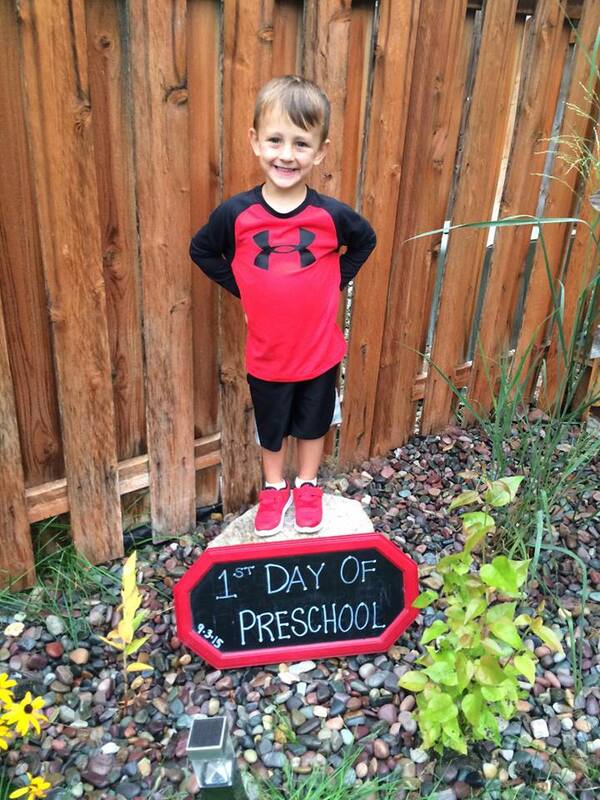 Ryder started his third year of Preschool today. He will have one more year after this before he starts Kindergarten. As someone put it today, he will have his Doctorate in Preschool when he is done. Ryder got to start bringing lunch to preschool with him and he was very excited about that. He also started an Arts and Movements preschool class at a local gymnastics facility in town. It will be a good place to get some energy out and switch things up a bit. I asked Ryder if he wanted to wear something cute for his first day and he said "nah." He prefers his "comfy clothes" aka athletic gear. Links to the past four years of back to school pictures. It's fun to look back and see how much they have changed and grown over the past few years. Crazy! Cheers to another great school year!